I was very lucky in my life. I realized this, unfortunately, only many years later and understood with what person I had a chance to communicate. I was born in Rybnitsa, in a believing Jewish family. The town was small, most of the inhabitants after the war were Jews, and so, contacts with the Rebe Chaim Zamvl were quite close. I often ran to the synagogue: or to cut the chicken, then with the father for the holidays. Chaim Zamvl knew my father since their childhood; he was even some distant relative of ours. After we moved from Rybnitsa to Chisinau in 1956, he visited us while being in the city. Most often it happened at dawn at 4 or 5 in the morning. Chaim Zamvl did not speak Russian well and wore traditional Jewish clothes, so he did not walk around the city in the daytime, where he would cause surprise or even insults. In the war, the Rebe was in Rybnitsa ghetto. There were fewer Jews killed than in the other ghettos thanks to Chaim Zamvl. I learned the story of salvation from a prisoner of this ghetto Oyzerovich. In the ghetto was a believing Romanian officer. He, seeing that he was dealing with a deeply religious person, gave him a soldier to go daily to the Dniester river for washing. On what it was ordered to hold the action in an organized way: to separate men from women. Then the order came to separate children from their parents. They stated to tear off children from their parents, which led to screaming, crying, hysterics and wasting time. Then the order came to separate the old men and women. In a word, they separated and built into columns, while the German no longer had any requests. When they learned that the destruction was due in the morning, and it was already noon, an order was issued to disband the columns to the barracks. The action was to be carried out early in the morning of the next day, and in the same order to withdraw the prisoners for elimination. At night, the Red Army’s on tanks made a breakthrough of the front and liberated the prisoners of the ghetto. Chaim Zamvl remained in Rybnitsa after the war. My father often accompanied him to the river to make mikvah, it was conducted in any weather. In winter, sometimes frosts reached -20 degrees C, but the rebe plunged into the water of the ice-hole. When they started to release Jews from the Soviet Union, Reb Chaim Zamvl left for Israel, and then moved to the United States. Details of his life in the US are not known to me. About him articles and whole books are written. He was called a miracle worker. I just remember that Chaim Zamvl had penetrating eyes and deep faith in God. Rav Chaim Zanvl Abramowitz (the name is also pronounced as Chaim Zamvl), who was born in 1902 (according to some data 1912), and died on October 18, 1995, was known as the Ribnitzer Rebbe (ריבניצער רבי), and considered a great Hasidic tzadik from Rybnitsa (present-day Transnistria, Moldova). 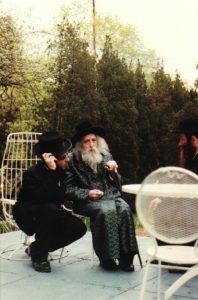 Rav Abramowitz was a prominent follower of Rabbi Avrohom Matisyohu of Shtefanesht. He managed to live a fully Jewish religious life even under Stalin’s rule. He served as mohel and shochet. He often fasted and immersed himself many times daily in water that was sometimes only accessible by chopping away very thick ice. His Tikkun Chatzos (midnight prayer service) in sackcloth and ashes regularly lasted 6–7 hours, sometimes stretching as long as 12. 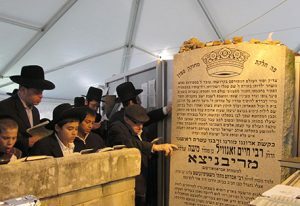 He cried so much during Tikkun Chatzos that when he was done, the tears and ashes mingled so that he was sitting in mud. He left Russia in 1970 and moved to the Jerusalem, where he lived for a few years before moving to the United States. He lived in Miami, Los Angeles, Seagate and Brooklyn, before he finally settled in Monsey, New York, where he died on Isru Chag (Succos). He is buried in the Vizhnitzer Cemetery.